I am trading Nifty Futures discretionary again. I had decided not to post the trades, but then decided to post because a couple of days ended profitably. Let me also admit that I would not have posted these trades if the days had ended in losses. Since these are discretionary trades, it makes sense to record the day's analyses and actions, ostensibly for future reference. If my record on this blog is anything to go by, I will probably post trades until I get hit by the next big drawdown. For now, I have decided not to live tweet my trades. It was the first day of the August series, and was a dull day. After the first big bar, there were bounces from the previous day's support level. I did not enter there because I thought that I should wait for better setups. The price did move to the target 8700 from there. In this round of trading, I have decided to be patient, and trade less, even if I miss many good trades. I have been retweeting about patience on my Twitter timeline. 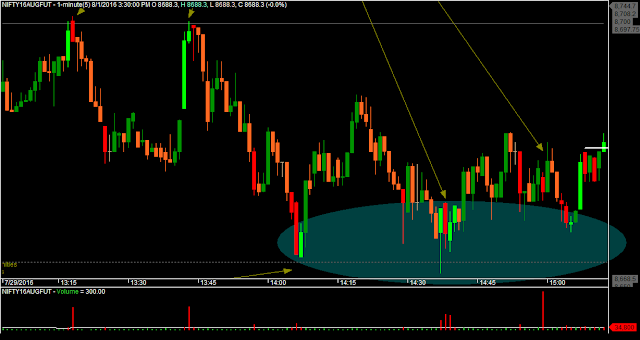 At 8700, a pin bar with good volume formed. I placed my entry below that bar. The bar that followed took out the high of the pin bar, but I decided to keep the trigger. I moved my Stop Loss to the pivot high below 8700, but soon the price action scared me into moving the Stop Loss back above 8700 again. Couple of times the price rushed upwards, and I thought that the trade would end in a (small) loss, but right at the previous day's closing price, the volume spiked and price retreated. Magic!! Here's a zoomed in view on the M1 chart. I am planning to stick to the motto of not taking big losses, and not taking small profits. 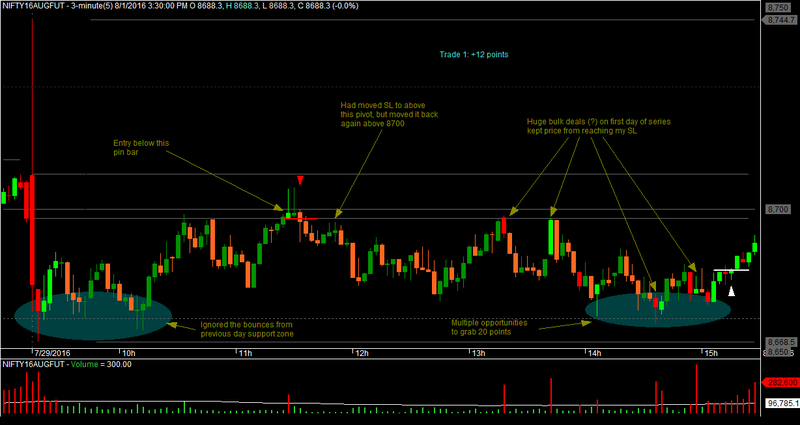 For now, I have defined the profit target to be at least 20 points. There were a few times when the price reached that objective. I would have definitely moved the Stop Loss to +20 points, if price had touched the Low of the Day at 8668.5, but that did not happen. Exited on auto-square-off. I have been quite detailed on this post. Maybe, it will help me in the future.